To the outside observer, Stephen Rose was both an accomplished and purposeful young man. He was a graduate of Harvard College and recently earned a master’s in psychology; he was also in the process of choosing among his law school acceptances. His path forward, however, was complicated by the fact that he had been battling mental illness for years. In the last hours of his life in February 2014, in a moment of extreme crisis, Rose contacted mental health care providers and called 911. Despite doing all that he could to get the help he needed, Rose ended his own life on the college campus where he had spent his formative undergraduate years. Evan posted his essay to Tumbler, allowing it to autopost to Facebook and Twitter, without giving too much thought to the response he might receive. He was surprised, but moved, when unexpected messages started pouring in. “I got dozens and dozens of emails from people in my network, people who are young professionals or who are in college, who are struggling with mental health issues,” Evan says. The messages reminded Evan and his family, in the midst of their grief, that they were not alone. Other families were concerned about a son, a brother, a sister or a daughter who were fighting the same sort of fight Stephen fought. Evan’s post helped open up a dialogue among his friends about the kinds of issues they previously faced in isolation. When the Rose family looked around to find what sort of resources were available to families of color with children in college, they found that there was no overarching framework for colleges to follow when addressing the specific needs of minority mental health. In response, the family decided to marshal their resources to create a fund that would help promote mental and emotional wellness among minority college students. The fruit of their efforts is the Steve Fund, an organization that is dedicated to raising awareness about the specific mental health challenges that plague minority communities. Less than two years after the family’s devastating loss, their efforts are already animating a conversation that previously was set on mute. “Our goal is to try and make sure that no other family has to go through what we went through, while at the same time raising the dialogue on the issues of mental health in the minority community,” Evan says. The Steve Fund’s main objective is to provide better education about mental illness among minorities. The fund’s proponents believe that better education and a wider dialogue about these issues might help inform individuals and families about how to treat or even preempt the onset of serious mental illness among college students and recent college graduates. College counseling centers across the nation report seeing an increasing number of students come forward to seek help for their mental health concerns. Anxiety and depression rank as the most common mental disorders treated at college counseling centers, according to a study from the Center for Collegiate Mental Health at Pennsylvania State University. The study also found that the rates of depression, anxiety and suicidal thoughts are not meaningfully different between White students and students of color. Statistics show that mental illness touches a wide swath of the adult population, with relatively little disparity by race or ethnicity. According to a 2012 study from the Substance Abuse and Mental Health Services Administration (SAMHSA), the rate of mental illness among Whites was 20.6 percent, 19.7 among Blacks, 18.7 percent among Native Americans and Alaskan Natives, and 18.3 percent among Hispanics. The statistical outliers at the opposite ends of the spectrum are individuals identifying as two or more races, with a 25.4 percent rate of mental illness, and Asian Americans, with a 15.8 percent rate of mental illness. Those young people of color who are not diagnosed with mental illness but are suffering from symptoms that would appear to be depression or anxiety may be experiencing psychological distress as a result of the pressures embedded in their environment, Primm says. “The societal pressures and some of the challenges related to racism and other racial dynamics, such as microaggressions [on college campuses], add a heavy burden and can contribute to symptoms of anxiety or depression,” Primm says. Where significant statistical racial disparities begin to emerge is in the likelihood of whether an adult will seek mental health treatment. Minority adults are significantly less likely to look for mental health care than adults identifying as two or more races and Whites, according to a recent SAMHSA study, which found that only 3.1 percent of Asian American adults reported soliciting mental health care, followed by 5.7 percent of Hispanics and 6.5 percent of Blacks. By comparison, 14.4 percent of White adults reported seeking mental health care. The question is, why are minorities so statistically unlikely to seek mental health services? According to the SAMHSA study, the most commonly cited reason across racial groups for not soliciting mental health services was cost of care and lack of insurance. Scholars say that there are also cultural factors at play that prevent minorities from seeking mental health services. Mental illness is so “stigmatized” in minority communities, says Dr. Alfiee Breland-Noble, an associate professor of psychiatry at Georgetown University and consultant to the Steve Fund, that some are reluctant to look for treatment. Breland-Noble says that some of her patients can be very blunt about their fear of being further stigmatized in a society where they already feel “labeled” as a minority. “A patient in one of our studies said, ‘I’m already Black, I’m already a woman, I don’t need to be labeled ‘crazy’ as well. I have two strikes against me already. Somebody saying I have a mental illness is a third strike and I can’t deal with that,’” Breland-Noble tells Diverse. While African- Americans may often be unwilling to seek clinical treatment, they are more likely to be spiritually engaged than other demographic groups in the United States. According to the Pew Research Center’s “A Religious Portrait of African Americans,” published in 2009, nearly 8 in 10 say that religion is important in their lives, and 3 in 4 say that they pray on a daily basis. “Invariably, Black folks go to clergy first when they identify a problem and then they think about going to more traditional mental health providers, if they even get that far,” says Breland-Noble. Dr. Sherry Molock, an associate professor of psychology at George Washington University and a pastor at Beloved Community Church in Maryland, says that her clinical background is an “advantage” when paired with her spiritual work. “Both roles have insights about people’s suffering, but I think, as a psychologist, you’re more able to be discerning about whether something is sadness or it is something that is more clinically significant,” she says. Molock says that spiritual guidance and clinical care can be helpful when used in concert, but that one should not be used as a substitute for the other, particularly in instances of serious mental disorders. She hopes that Black churches can help begin to combat some of the stigma around mental health in the African-American community. Molock offers pastoral counseling at Beloved Community and says that other faith centers in the D.C. area are combining spirituality and more clinical work. Yet she acknowledges that there are still some Black churches that may inadvertently discourage churchgoers from seeking clinical help when they need it. “Sometimes I think people make comments in the pulpit, not intending to increase stigma, but they do,” Molock says. “Examples of that might be when people in the Christian community say things like, ‘You don’t need a psychologist, you don’t need a psychiatrist, you just need Dr. Jesus.’” However well-intended some statements might be, if they prevent someone who is suffering from finding mental health services, they do a disservice to the community, Molock says. First-time college students are at a uniquely vulnerable stage in their lives. They are uprooting themselves from their homes and old support systems, and they are doing so at a time when chronic mental illness is most likely to manifest. A full one-half of chronic mental illnesses begin by age 14 and three-quarters by age 24, according to the National Institute of Mental Health. Most colleges and universities offer mental health resources, and some even have programs and centers dedicated specifically to the needs of minority students. The University of Virginia, for example, is home to Project RISE, a peer counseling service that is connected to both the Office of African American Affairs and the university’s department of counseling and psychological services. While individual programs dedicated to the mental health needs of minorities are laudable in their own right, they could all gain from an increased dialogue to share best practices among themselves, says Dr. David P. Rivera, an associate professor of educational and community programs at Queens College (CUNY) and adviser to the Steve Fund. “There aren’t a lot of mechanisms out there to bind these institutions or to shed light on where the good work is happening,” Rivera says. 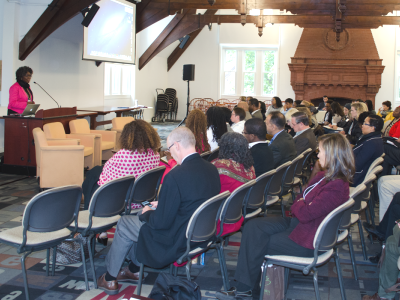 To address the perceived need for a greater dialogue among college counseling services, foundations, nonprofits and mental health practitioners about the specific mental health needs of minority students, the Steve Fund held its first academic conference last year at Brown University and will hold its second gathering at Stanford University on Friday. The Steve Fund’s outreach is not solely limited to college campuses. To reach a wider number of young people, the Steve Fund is also partnering with the Crisis Text Line, a texting hotline founded in 2013. Anyone can reach the Crisis Text Line by texting 741-741. The service provides texters with trained volunteer responders who provide active listening and can direct them to the appropriate resources if they are experiencing a mental health crisis or other emergency. Liz Eddy, director of communications and events at the Crisis Text Line, says that the organization recently received its 10 millionth text and on average receives 30,000 texts a day. Evan Rose, who is president of the Steve Fund, also runs an application development firm. He says that one of the things that drew him to the Crisis Text Line is his observation that technology allows some people to open up about problems in their personal lives in a way they might not feel comfortable doing in conversation. Where the Steve Fund and the Crisis Text Line can collaborate, Evan Rose and Eddy say, is in recruiting volunteers of color and creating a training program to allow them to address the specific needs of minorities who contact the text line. The Crisis Text Line operates with volunteer manpower, each one logging a weekly four-hour shift on the text line’s online platform. Volunteers complete a 34-hour training period before engaging with texters. Shifting views on mental health issues in minority communities is not going to be an overnight fix. It will happen conversation by conversation and, with the Crisis Text Line, text by text. Catherine Morris can be reached at cmorris@diverseeducationcom.